The Application will be determined by the Planning and Orders Committee at 1.00pm Wednesday 1st March in the Council Chamber – Council Offices, Llangefni. The meeting will be streamed by webcast using the link on the Council’s website. The paper for Agenda item 13: Other Matters, can be viewed by clicking this link. Here you will see the Inspector’s full report and the recommendation not to register the Newry as a Town or Village Green. In order to register land as a Town or Village Green a number of legal requirements must be satisfied. All requirements must be satisfied. We satisfied all but the crucial issue of whether or not the land was used “as of right”, that is without permission. The inspector concluded that we were using the land “by right”, that is by permission. We are pleased that the Inspector recognises the importance of the Newry to the local community. 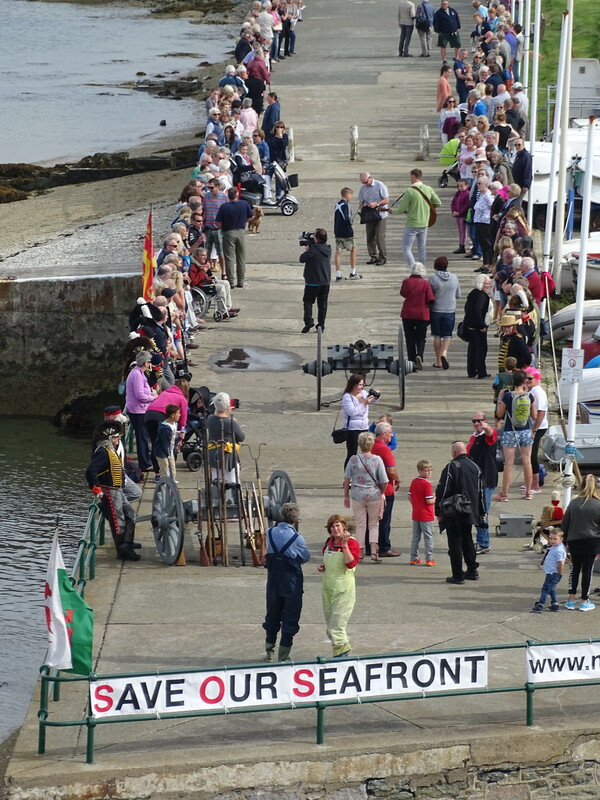 With the help of numerous supporters we were able to put forward a strong case, in what is a complex area dealing with legal issues of Leases, Acts and Harbour Byelaws. Thank you again to all who donated the funds to allow us to make our case. The Public Inquiry helped us to demonstrate how strongly we feel about the possibility of losing the uniqueness of the Newry as it is today, and has been for many decades. 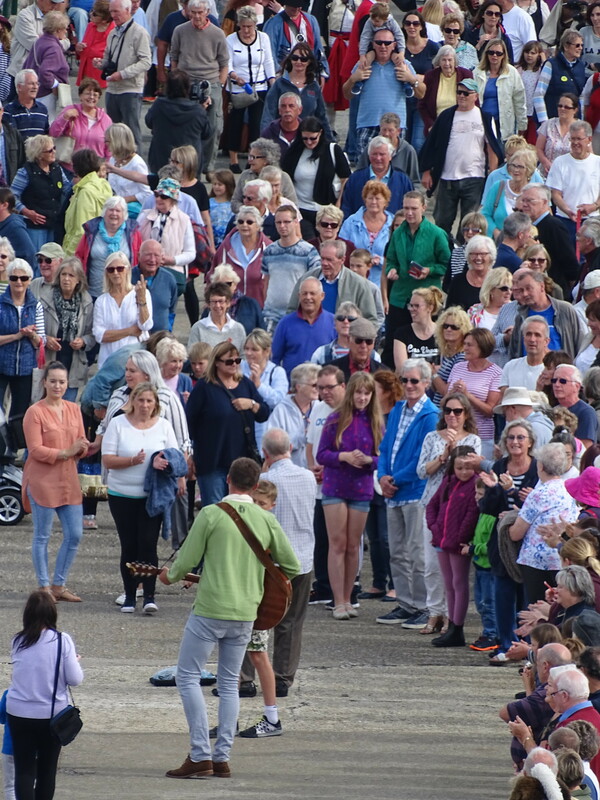 Whilst this is a setback for us in our campaign to Save Our Seafront, it is not the end of the campaign by a long way. Watch this space! NEWRY BEACH APPRECIATION DAY SUCCESS On Sunday 4th September at 3pm 500 supporters of the Waterfront Action Group protested on the promenade at Newry Beach, to show how much they appreciate the beach and Newry area the way it is now and that we do not want the Conygar Stena Waterfront Development on the Newry part of the proposal. 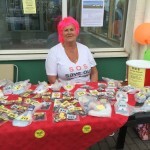 We raised over £1000 from our fund raising activities and from donations. 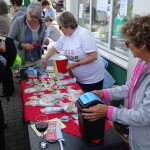 Thank you to all who contributed to make it a successful day. Isle of Anglesey County County will no longer have any interest in the Newry from 24th December 2016. This is when the Council’s lease will be surrendered to Conygar Stena Line Ltd so that their proposed Waterfront Development can go ahead. 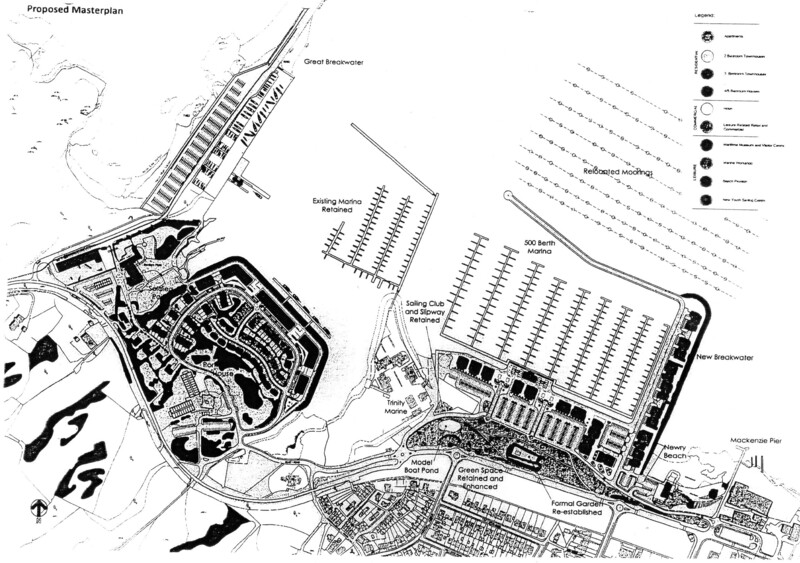 The Outline Planning which has been approved, shows that Newry Beach, Promenade and some parts of the lower greens, will be replaced by another marina and with apartments, shops, offices and car parks. From the Maritime Museum to the Sailing Club there will be No more beach. No rock pools. No swimming. No diving. No more sunbathing and picnicking and playing on the beach. No more sailing, No more kayaking between the Sailing Club moorings and the beach. The whole ambiance of the Newry will change for the worse. 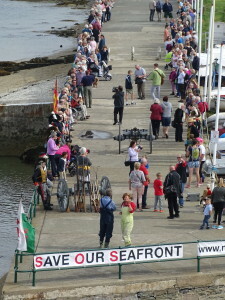 Welcome to the Waterfront Action Group Campaign to save our coastline starting at the Maritime Museum on Newry Beach to the start of the Breakwater at Soldiers Point, from destruction by Conygar Stena’s proposed Waterfront Development. Conygar Stena have been granted outline planning permission for a new 500 berth marina, 380 apartments and town houses, a hotel and over 43,000 sq feet of office, commercial and retail/leisure facilities. 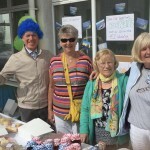 If this development is allowed it will destroy our beautiful coastline which is enjoyed by local families and visitors. 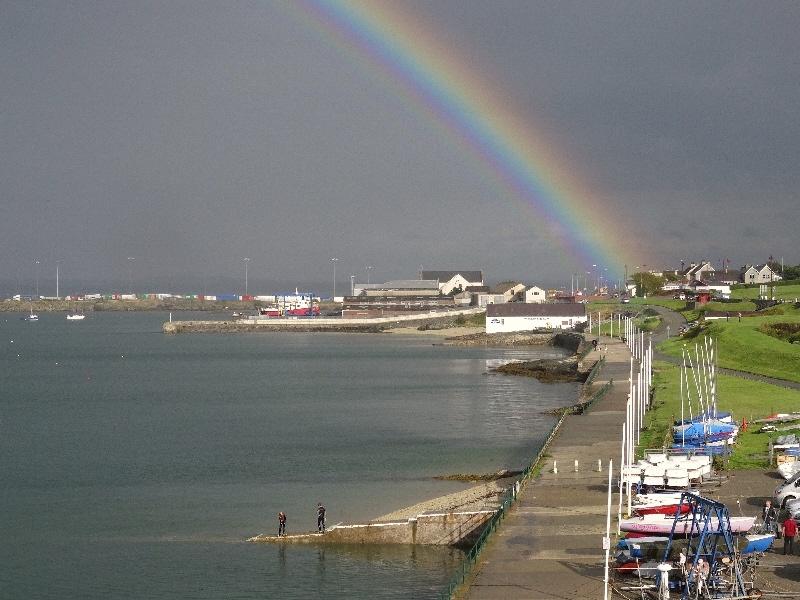 Newry Beach is Holyhead’s Pot of Gold. The jewel in the crown of Holyhead. Why destroy it? 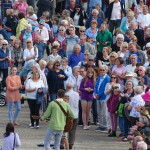 Newry beach and greens are close to the town centre and have been a place of rest, relaxation, tranquility and recreation for the people of Holyhead and visitors for decades. It is the greens, promenade and beach combined that makes the harbour so attractive. All must be retained and developed in such a way as to improve the attractiveness of the area and contribute to the economic growth of Holyhead and Holy Island. The Conygar Stena proposal will destroy this opportunity for Holyhead’s revival. There is no need for this massive development. There is already a marina with potential to expand, whilst apartments alongside the marina remain unsold 6 years after completion. There is also a hotel and restaurants, a cafe, general stores and leisure facilities. Furthermore, in today’s global economic climate, there is no guarantee that, if started, the proposed scheme would be completed. Newry Beach could end up looking like its twin town, Greystones in Ireland, where their Waterfront is far from completion. For several years much of Greystones waterfront was inaccessible; no public access. Only recently has access been re-established and the harbour and marina opened. Look through our website where we describe our beach, coastline and heritage, and where we raise questions, issues and serious concerns about the proposed development. Conygar Stena’s plan for the regeneration of the waterfront, Holyhead will destroy Newry Beach. 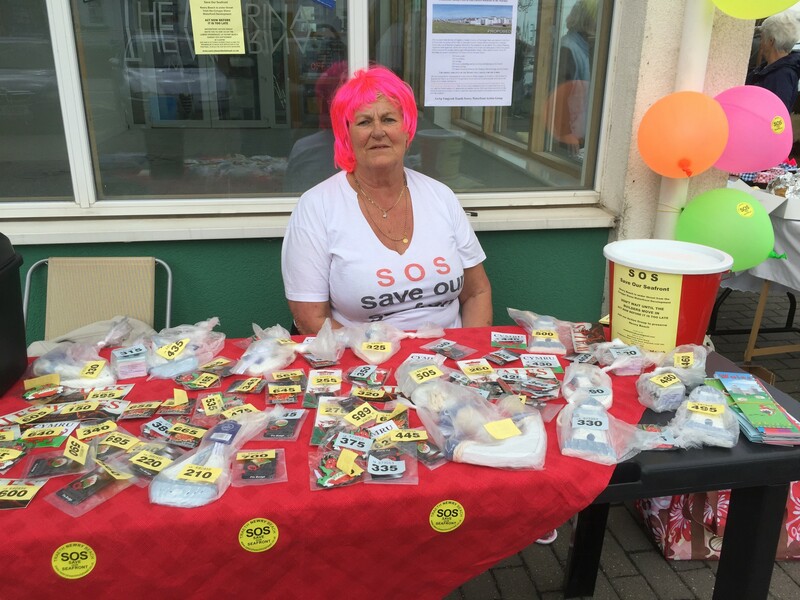 The Waterfront Action Group was set up to SAVE NEWRY BEACH for the people of Holyhead, visitors and tourists. 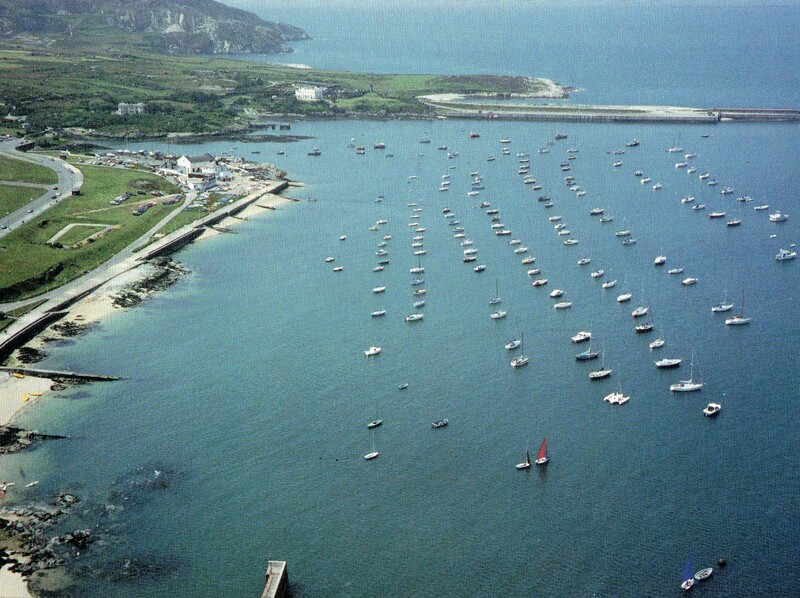 The beach has been a place for recreation, fun and leisure for decades and it seems unbelievable that Holyhead Town Council and Anglesey County Council have signed the ‘Newry Beach Destruction/Death Warrant’ by supporting the scheme and granting outline planning permission in June 2012. The only benefit of the development that our Councillors and Politicians seem to believe is that it will provide JOBS for local people. The grossly exaggerated number of jobs declared by Conygar Stena is pure fantasy. Yes we do need the jobs but the very small number and type of local jobs is not worth destroying a beautiful natural coast and seafront recreational amenity. 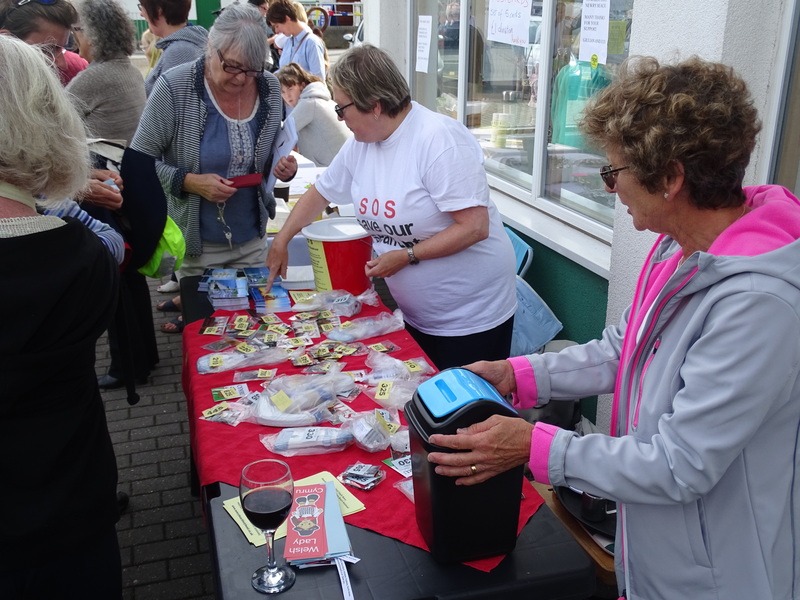 Ask the people of Holyhead; do you want a handful of seasonal and low paid jobs in exchange for losing your beach for ever? We ask our Councillors; Do you want to go down in history as the Councillors who destroyed our beach to line the pockets of Conygar Stena and their investors? IT IS NOT TOO LATE FOR THE COUNCILLORS WHO SUPPORT THIS HIDEOUS SCHEME TO STOP THE DESTRUCTION OF NEWRY BEACH. 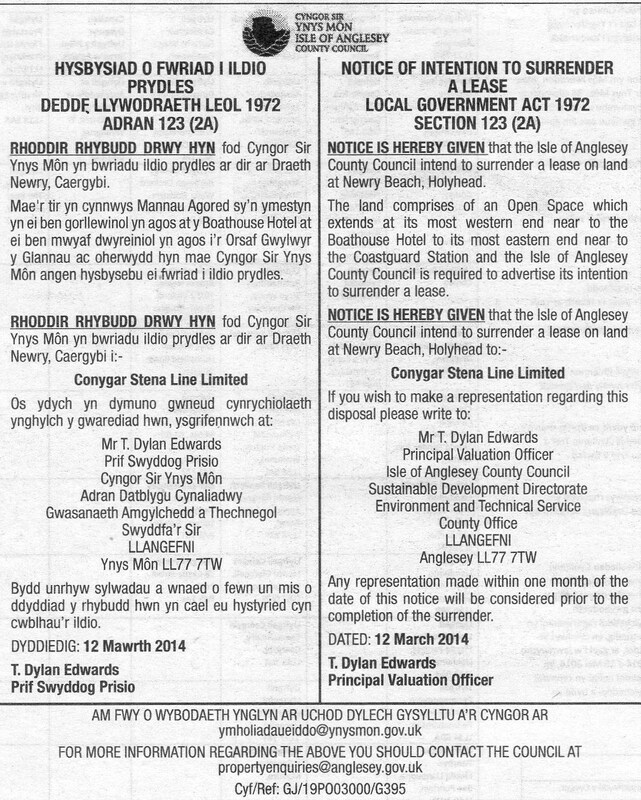 Anglesey County Council own a lease on Newry Beach to 2025. Conygar Stena have asked the Council to give up this lease. We urged our Councillors to SAY NO and to keep the lease to 2025 and beyond. Here is the notice published on 12th March 2014 about the lease surrender. The Executive of Anglesey County Council have agreed to surrender the Newry lease. We understand that the lease surrender has not been signed due to a number of legal issues which require resolution. There are many opportunities around the Port where similar developments can be built. Make Conygar Stena consider these before Newry Beach is destroyed. 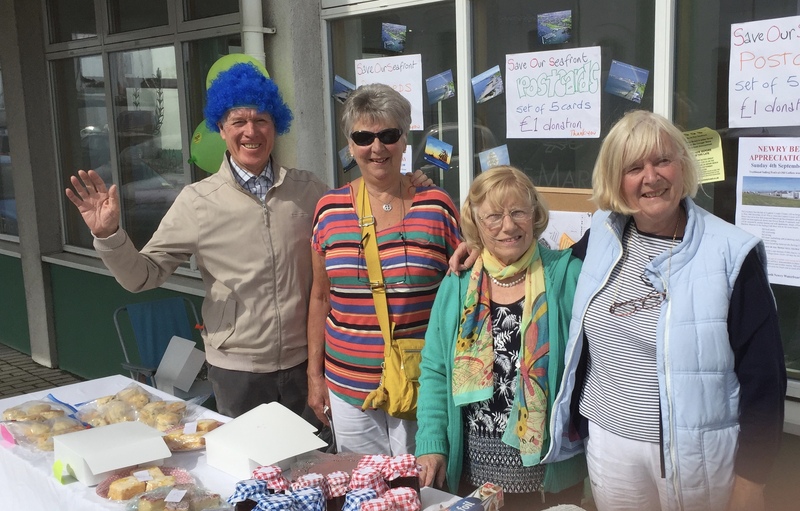 We say to Stena Line show some community conscience and illustrate your commitment to the well-being of the people of Holyhead and Anglesey by saving our seafront. Withdraw your request to Anglesey County Council to give up their lease. 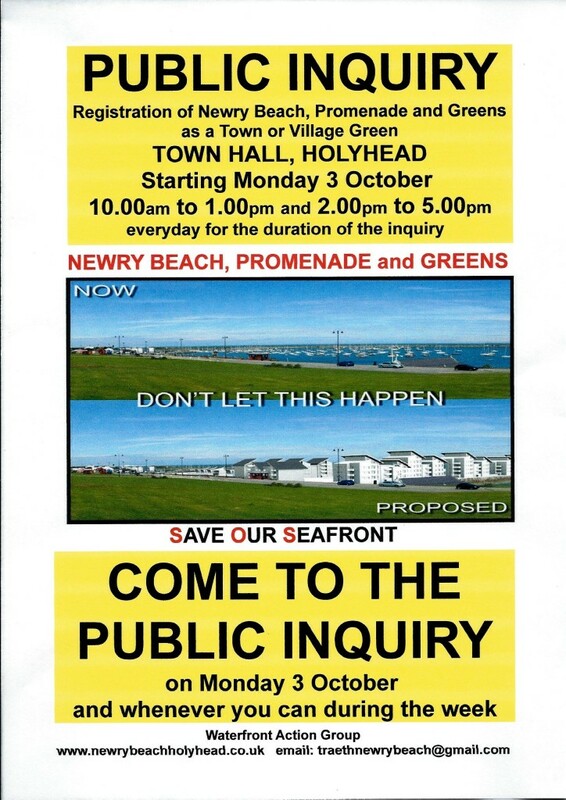 Withdraw your plans to develop Newry Beach; show some environmental conscience. Below, Figures 1 to 3 showing images of Newry Beach: past, present and what could happen! Fig 1: Photo of Newry Beach in the late 1990s. Fig 2a: Conygar Stena impression of what Newry Beach could look like if the development goes ahead (we added the text). Fig. 2b. Views from Beach Road from impressions published by Conygar Stena. Fig 3: Proposed masterplan of what Newry Beach could look like if the development goes ahead.